(Brian Maffly | Tribune file photo) Latigo Wind Park, a new 27-turbine power-generating project outside Monticello, provides nearly 62 megawatt of electricity to Rocky Mountain Power. Commissioners in some rural Utah counties are upset over the utility’s recent decision to build a $3.5 billion wind farm project in Wyoming, while many rural Utah communities are struggling for jobs and economic development. Despite being the state’s largest provider of electricity, Rocky Mountain Power is overlooking the potential of renewable energy in rural Utah, some county commissioners say. Rural Utah has ample opportunities for renewable development, they say. But Rocky Mountain Power has chosen to invest in a $3.5 billion wind farm project in Wyoming — and didn’t even discuss the possibility of locating the project in Utah before making the decision, the commissioners say. Rocky Mountain Power unveiled plans in April for the 1,100 megawatt wind farm overhaul and expansion to be built in southwestern Wyoming in the next three years. Its announcement took many by surprise, partly because the proposal was not included in earlier drafts of the utility’s long-term plans, which must be regularly presented to state regulators. Whitney and county commissioners from rural Utah say Rocky Mountain Power should have given them a chance to argue for building the project near one of their communities, where they say there is plenty of opportunity for energy development and where jobs are badly needed. 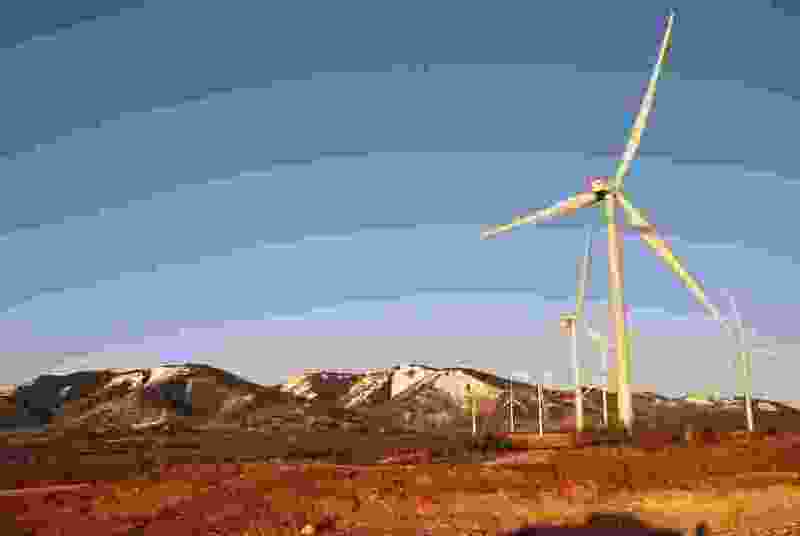 Since some of the power generated at the expanded wind farm will come to Utah, Ogden said, Rocky Mountain Power should have considered locating the facility within state boundaries. Rocky Mountain Power spokesman Spencer Hall said the decision to build the wind farm in Wyoming was largely based on the availability of wind — and a set of federal incentives that were set to expire in 2020. “This isn’t coming at the expense of Utah. It doesn’t mean that we won’t ever invest in Utah,” he said. “But we’re a company with a presence in many other states, and we go where the opportunity is. There’s wind in Wyoming, and solar in Utah. “If there’s a lake there, we do hydro[electric power] on it. If the wind is blowing, then we can put windmills there. It’s simply a matter of the availability of a generation source,” Hall continued. But ample resources are available in rural Utah, Whitney said. His home base in Beaver County is “the renewable energy capital of the world,” he said, with opportunities to generate power using wind, geothermal, solar, hydropower and biomass. Other companies have sited new developments in Beaver County, Whitney said, but most of the energy they produce is exported to California. Stan Summers, chairman of the Box Elder County Commission, said his county fortunately is close enough to the Wasatch Front to become a bedroom community to urban areas, buffering it to some extent from rural economic challenges. But he said he worried about the prospects of more remote counties, especially those not on the Interstate 15 corridor. These counties rely more heavily on their natural resources to generate jobs, he said, and many have lost economic ground as the coal industry has declined. Summers said Rocky Mountain Power should do more to help coal-reliant communities by developing renewable energy sources available in those areas. Coal-related jobs still account for one-third of the tax base in Sevier County, Ogden said — and they are fortunate, he said, because coal remains a growing business in Sevier. But Ogden said the county would like to diversify and develop more renewable energy, as well. Hall said Rocky Mountain Power strives to help coal-dependent communities transition to a more diverse economy. When the utility closed its Carbon coal-fired power plant near Helper in 2015, it did so without laying off a single employee, he said. Workers from the plant were transitioned into new jobs or transferred to one of the company’s two other coal-fired power plants in Utah.